Ok, so due to the success of my other thread, I decided to make a new one. I re-used a challenge from the old thread. I will make more but here's my first two. I encourage you to post your own. Remember: You use the white pieces to build. Oh, and new rule: distance joints must be ZERO LENGTH, like a hinge but breakable. You also need to stop the green block from falling, so don\'t use all your connectors. Build a structure to defend against incoming bullets. You have $10000 to spend. Prices are in game. The timer underneath the platform indicates the winning threshold. You can only use the blocks provided and only in the red area. And CERTAINLY no triggers. 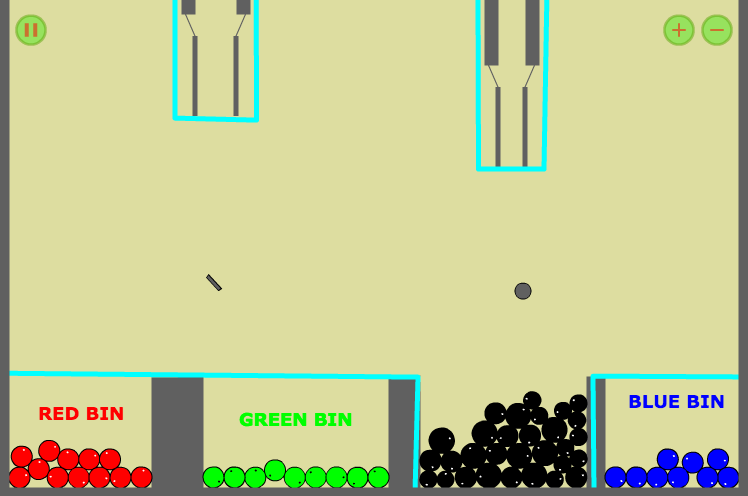 This is a variant of challenge 7, the ball-sorting challenge, of the first thread. The colored balls are indistinguishable, but the black ones are related. A red ball produces a light, small black. A green ball produces a medium-sized, slightly heavy black one. A blue one produces a heavy, large black ball. The black ones cannot go in the bins. I don\'t have an entry yet. This is a series of challenges. No triggers, browns, yellows, sensors, CC\'s, power sources, gravity, editing pre-made objects, attaching joints to pre-made objects ("oh! I\'ll attach dummy joins with \'collide connected\' false! "), gluing to pre-made objects, or setting the connection shapes from settings. So easy, you should be as creative as possible. Negative friction, traps, and more. All in one. Solves permanently. Suppress your instinct to set the restitution of the ball. or the 10-shape all-static all-circle solution where the ball hits every circle exactly once in order of radius! Three shapes and three joints. Time limit: 1.5 seconds! No motors. Random number generators. There are 5 possible patterns. All are possible. Only one entry please! This one is actually hard. I\\'m letting you set the world gravity, by vector (x, y) or by degrees (r, ø). You can set the properties of the action, but nothing else. And you can ONLY set gravity. That\'s all for now. More levels coming soon! Scripting Challenges! These challenges force you to USE triggers! But there\'s a catch: you can\'t just do whatever you want! Note: Due to technical difficulties, go to the official challenge compilation. how big is 1 on the scale mathdude? also, you forgot to enable source code on the 2nd one. Here's a simple solution for the second challenge, with total cost merely $425 (maybe even better with some optimization). The basic idea is that while a bullet might pierce an iron shield if it hits head on, the shield can deflect the bullet at an angle to minimize the force transfer. Even with the weld joint rule patch, you could just attach an additional 4 x 0.5 wood block and weld joint connecting the two others for a theoretical cost of $600. Anyway, here's my two-shape solution to the third challenge. 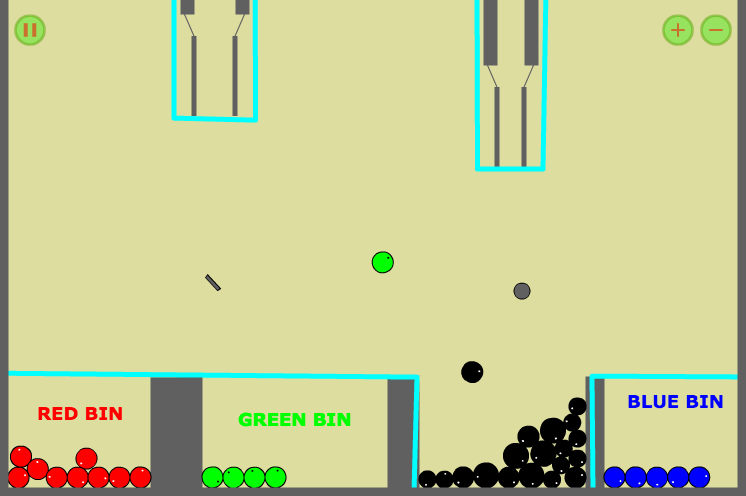 The solution takes advantage of the fact that even though the three black balls may collide with the same force angle, the time at which this happens is dependent on its radius, producing minuscule differences in the bounce speed. In case you're wondering, the two statics have restitutions of (left) 1 and (right) 0.7. No crazy physics here. Wow Xyuzhg, that is freaking epic! Look in challenge 4 spoiler! It has 5 levels: EPLS (easy peasy lemon squeezy), pretty easy (I want to use high-restitution blocks for this one), medium, hard, and one that's randomly generated (only 5 possible outcomes). Here's a solution to 4e which uses 21 of the exact same 0.08 radius sphere, each with restitution 1. Here's a challenge from me (which was a little exercise in level design at first). This is a sorting challenge. You must sort generated boxes which are essentially identical except for their initial rotation, as indicated by a small indentation in one of the sides. Exactly six of each type is generated each time, but in a random order. The boxes are color coded for your convenience. - Build entirely inside the red polyline box. - Do not edit/connect via joints/glue to the world and premade objects except for the background. - Shape restitution and friction are limited to [0,1]. Except i cant load it in the editor too. Do note that I'm using the editor v2.10. I'm not sure why you'd use v2.04 (as shown by the context menu of your levels) when there's a newer version. Xyuzhg, your challenge wasn't quite that hard. that said, I made a function that will destroy any block with a large enough impact. What I would like to see, is this challenge here, done with no bouncy stuff. Because I found Bio's no bounce idea so great, I designed a simple challenge based on that alone. Get the acceleration-sensitive block to infect the sole yellow. I calculated the suspension spring constants such that the object resists up to 1.5g of acceleration (orthogonally). The problem with 4f is that it's hard to see any reasonably simple solution outside of using high restitution objects. Actually, I was going to do something like that. I assume you did about a 60° gravity direction? You never said 'no gravity controllers'. It's probably time for another new concept. Standard stuff. Infect all the yellows and don\'t infect the greens. Here's my entry for Vanderwaal's challenge! I added triggers to make it interesting. But, they can be deleted and the level still works. You can only use the custom function "Move" in the Allowed Functions package to actually do things. You can use functions like Get Position, Number < Number, Assign String, etc. But the only thing you can do to move the ball is my custom "Move" function. Yes, THAT is easy, but did you try the second challenge in that series? I made two and will make another very shortly.